NASA's New Horizons spacecraft is now almost seven years into its 9.5-year journey across the solar system to explore Pluto and its system of moons. Just over two years from now, in January 2015, New Horizons will begin encounter operations, which will culminate in a close approach to Pluto on July 14, 2015, and the first-ever exploration of a planet in the Kuiper Belt. As New Horizons has traveled through the solar system, its science team has become increasingly aware of the possibility that dangerous debris may be orbiting in the Pluto system, putting NASA's New Horizons spacecraft and its exploration objectives into harm's way. 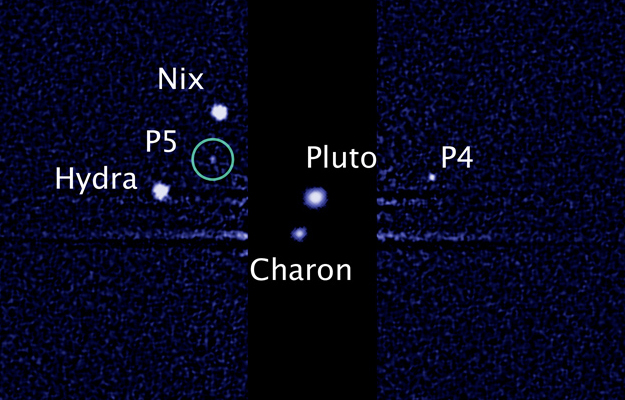 "We've found more and more moons orbiting near Pluto -- the count is now up to five," says Dr. Alan Stern, principal investigator of the New Horizons mission and an associate vice president of the Space Science and Engineering Division at Southwest Research Institute. "And we've come to appreciate that those moons, and those not yet discovered there, act as debris generators that populate the Pluto system with shards from small, colliding Kuiper Belt objects." "Because our spacecraft is traveling so fast -- more than 30,000 miles per hour -- a collision with a single pebble, or even a millimeter-sized grain, could cripple or destroy New Horizons," adds New Horizons Project Scientist Dr. Hal Weaver, of the Johns Hopkins University Applied Physics Laboratory, "so we need to steer clear of any debris zones around Pluto." The New Horizons team is already using every available tool -- from sophisticated computer simulations of the stability of debris orbiting Pluto, to giant ground-based telescopes, stellar occultation probes of the Pluto system, and even the Hubble Space Telescope -- to search for debris in orbit. At the same time, the team is plotting alternative, more distant courses through the Pluto system that would preserve most of the science mission but avert deadly collisions if the current flyby plan is found to be too hazardous. "We're worried that Pluto and its system of moons, the object of our scientific affection, may actually be a bit of a black widow," says Stern. "We're making plans to stay beyond her lair if we have to," adds Deputy Project Scientist Dr. Leslie Young of Southwest Research Institute. "From what we have determined, we can still accomplish our main objectives if we have to fly a 'bail-out trajectory' to a safer distance from Pluto. Although we'd prefer to go closer, going farther from Pluto is certainly preferable to running through a dangerous gauntlet of debris, and possibly even rings, that may orbit close to Pluto among its complex system of moons." Stern concludes: "We may not know whether to fire our engines on New Horizons and bail out to safer distances until just 10 days before reaching Pluto, so this may be a bit of a cliff-hanger. Stay tuned." New Horizons (http://pluto.jhuapl.edu) is the first mission in NASA's New Frontiers program. APL built and operates the New Horizons spacecraft and manages the mission for NASA's Science Mission Directorate. SwRI led the payload instrument development and leads the New Horizons science and mission teams from the Tombaugh Science Operations Center located at SwRI facilities in Boulder, Colo.